Approx.3 min. walk from Rinku Sta.JR Approx. 40 min by Kansai Airport Express from Tennoii Sta. Nankai Approx. 37 min. by Airport Express from Nanba Sta. 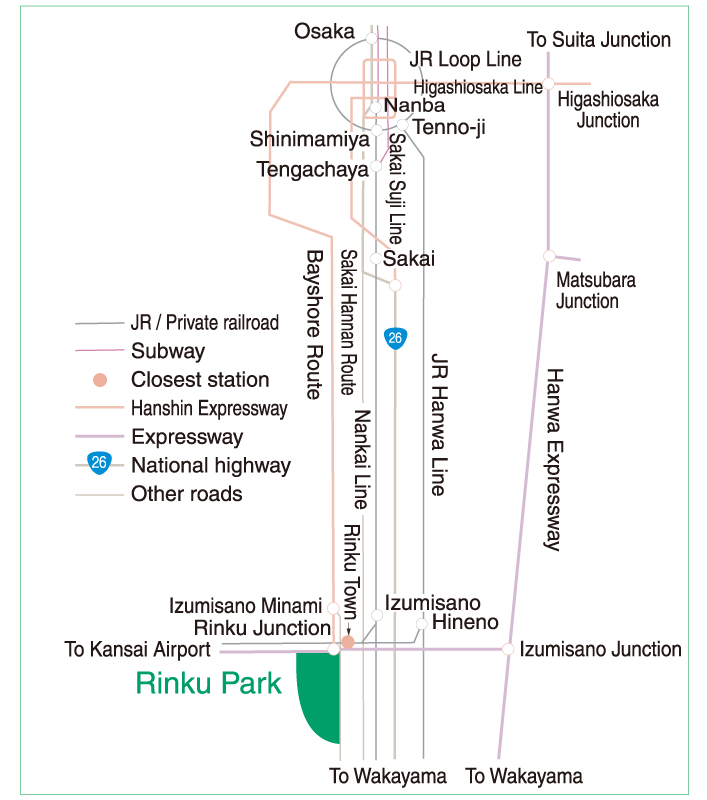 Take Izumisano Junction on Hanwa Expressway and exit atIzumisano Intersection onto Kansai Kuko Expressway. EXit at Izumisano Minami Ramp on the Hanshin Expressway Bayshore Route. Cars must be parked in the parking lot. Treat park facilities with care. Take all trash back home with you. Flowers, trees, birds and fish are alive. Please be advised the Inner Sea abruptly becomes deeper. Don’t do anything that might endanger other park visitors. Do not make bonfires or bring dangerous articles to the park. Unauthorized sale, distribution, setting up stalls or advertisement of goods is prohibited. 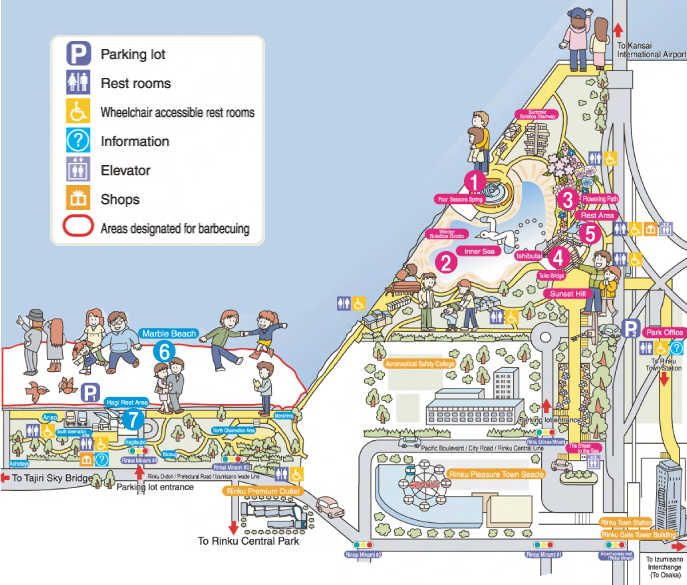 the Osaka Prefectural City and Part Development Ordinance. ◆The Four Seasons Spring is directly to the west when viewed from the Taiko Bridge. to the right, and the sun sets there on the summer solstice day. On the left is the Winter Solstice Grotto. That is where the sun sets on the winter soistice day sunset. 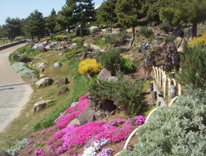 Walking along flower paths by the sea, visitors can enjoy splendid views of landscapes and the flowers of the season, and repose in the intimate atmosphere trees provide. The Taiko Bridge draws a large arc reminiscent of days long past. 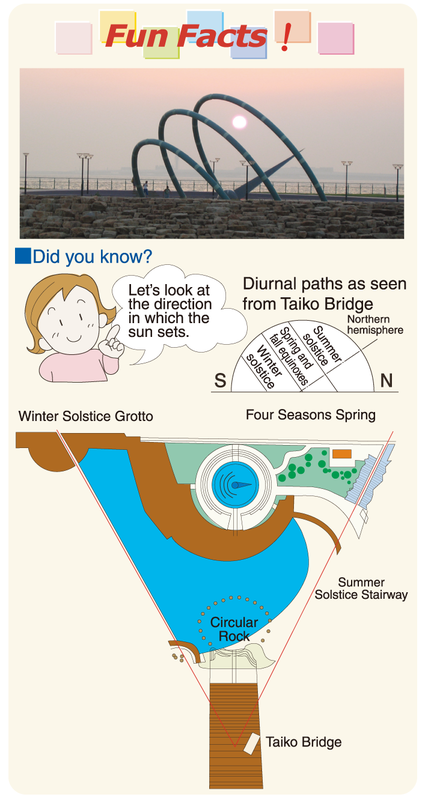 Witness the changes in season by watching the location of the sun set into either the Summer Solstice stairway, the Winter Solstice Grotto or the Four Seasons Spring. 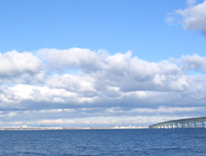 This park offers ａ unique vantage point from where visitors can watch airplanes take to the skies from Kansai International Airport just across the water, and see Awaji Island and the Akashi strait Bridge in the distance. A visit to Rinku Park is sure to be an exhilirating experience whether it be with your family, your friends or that special someone. sphere in the center represents the Earth. At night the spring is illuminated, adding to ａ beautiful night scenery visitors can enjoy. 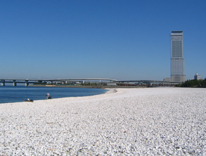 This shoreline enables the visitor to appreciate the sea. 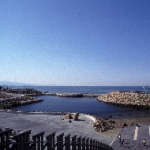 Since it is connected with the outer bay, it shares the same tide cycle. flowerbeds that bloom from spring through fall. 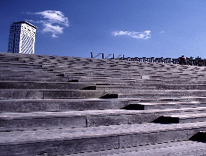 Visitors can sit on the stairs and watch the sun set or airplanes embark. Music festivals and other events are held using this bridge and Ishibutai. 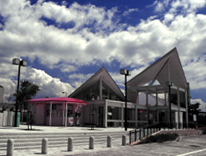 Located at the center of the park, this facility is used as an informationcenter. Visitors can also go directly to the crest of the Taiko Bridge from thesecond floor. The third floor has ａ unique view of the entire area. Created with an image of 9｢een pines and white sand in mind, the Marble Beach lets visitors enjoy the scent of the sea breeze and the sound of the surf. Visitors become immersed in vividly lush greenery and feel a sense of boundless merriment. Five small gardens along the side of the road represent the Morishima, Ariso and other traditional Japanese gardening styles. 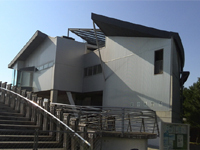 Visitors can relaχ in the Hagi Rest Area. You’ll forget the passage of time as you gaze at the vast, changing scenery outside the window from the parkinglot facing the sea. A While marbled beach with luxuriant green pines. Relax and let time flower by as you listen to the sea breeze. Your spirit will naturally become more peaceful as you gaze out to the distant sea. Next to the Hagitsubo,there is a field full of the pale crimson bush clover, one of the seven flowers of autumn. Copyright© 一般財団法人 大阪府公園協会 All Rights Reserved.